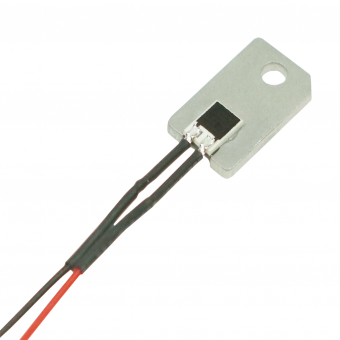 This humidity sensor SHS-A4L is a resistive dew sensor with miniaturized dimensions for detecting the beginning of condensation. The sensor is pre-mounted on an aluminium plate for an easy installation. Unwanted dew formation or adverse effects of condensation on cooling systems, pipes and technical devices can cause extensive damage, should you not react in time. It is especially for this quickly recognition of considerable risk of condensation, or already existing condense water that this special SHS series of resisitve dew sensors has been developed. The offered version here comes premounted on an aluminum plate, which makes the installation on planar surface very easy. At high values of the relative humidity (>80%RH) where condensation risk becomes imminent, the sensitivity of the electrical resistance against changes of the humidity increases dramatically. This behavior of the characteristic curve (R vs. %RH) allows the setting of exactly defined switching points close to the dew point without needs of adjustment to the circuit.